No one does automated scheduling for Infusionsoft better. When a prospect or customer schedules with you, their contact record is immediately and automatically created or updated. Create and send customized, professional confirmation, reminder, and followup emails directly from Infusionsoft upon booking. Automatically add Infusionsoft tags to a contact record after each booking based on the type of appointment scheduled. Use tags to trigger campaign sequences, track customer history, and more. Have a webform that your prospects complete before or after scheduling with you? Add it to your booking link for a seamless booking experience. Create and use Infusionsoft custom fields for the appointment details and include them in your customer's emails and communications for a more personal touch. Maximize your bookings by allowing your customers to book directly from your Infusionsoft campaign emails. AppointmentCore will recognize the contact's information and direct them straight to the confirmation page after scheduling. Use API calls to trigger campaign sequences, create opportunities, notes, and tasks, and other actions at any time before or after the appointment. The possibilities are endless! 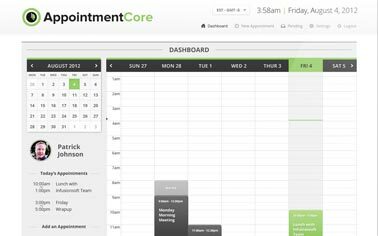 Add your personalized AppointmentCore booking links to your Infusionsoft template emails, webforms, and more for scheduling that reflects your business's style. Check out these other GREAT products from some of our AppointmentCore customers! Track attendance and automate check-in with PlusThis! A help desk built specifically for the Infusionsoft community.